Trump Has Yet To Sever Ties With His Business, Despite Promises To Do So, Report Says : The Two-Way Trump had said he would surrender control to two of his sons by Friday, but ProPublica says there is no sign he has done so. 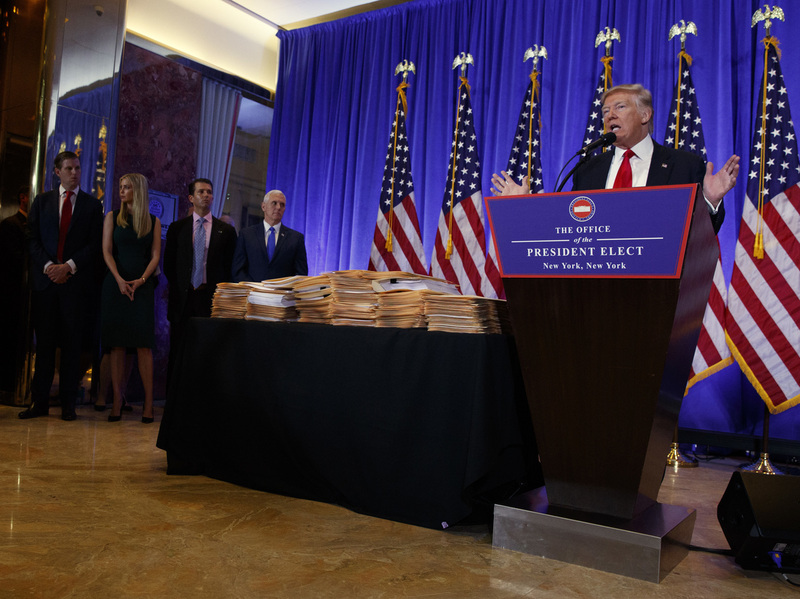 As president-elect, Donald Trump promised to give up legal control of his companies at his Jan. 11 press conference. Next to him was a stack of documents he said would sever his business ties. No evidence exists so far that President Trump or his elder daughter has taken steps to sever ties with their businesses, despite promises to do so by Inauguration Day, ProPublica has reported. "To transfer ownership of his biggest companies, Trump has to file a long list of documents in Florida, Delaware and New York. We asked officials in each of those states whether they have received the paperwork. As of 3:15 p.m. today, the officials said they have not." Trump has been criticized for continuing to own a wide array of businesses while in the White House. He has refused calls to sell his companies and put the assets in a blind trust, saying he would turn them over to his sons to manage instead and would have nothing to do with managing them. Trump said at a Jan. 11 press conference that he and his daughter Ivanka had signed documents giving up control of all Trump-branded companies. Next to him on a table were stacks of documents he said transferred "complete and total control" of the companies to his sons Eric and Donald Jr. and another employee. A Trump attorney said that he "has relinquished leadership and management of the Trump Organization." The businesses would be placed in a family trust by Inauguration Day, the attorney said. But ProPublica quoted the New York Secretary of State's Office as saying no changes have been made to business filings for his primary holding company, the Trump Organization. The Florida Department of Corporations said no changes have been made to three Trump businesses located there. ProPublica also reported, "Ivanka Trump is still listed as the authorized officer on records for two entities related to the Old Post Office in Washington, D.C.," which the Trump family leases. It adds that "no changes have been filed for either of the companies, which are registered in Delaware." Ivanka Trump is married to Jared Kushner, whom Trump has named as a senior adviser.